Would you like your child to develop a strong mind, a healthy body and a balanced moral compass? Choi Kwang Do (CKD) can enhance your child’s powers of concentration, self-control, discipline and self-esteem. 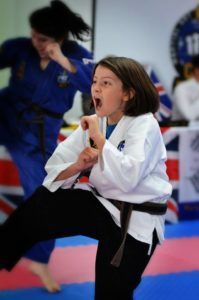 Children’s Choi Kwang Do is a healthy, fun workout that promotes a winning but disciplined attitude, which encourages better behaviour at home and at school whilst promoting the mental strength to undertake life’s challenges. You can see that, simply by following these principles, your child will develop positive mental, physical and emotional skills. 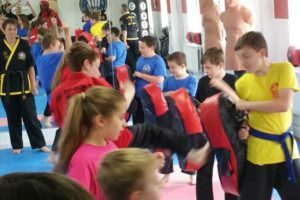 Your child’s Choi Kwang Do training is about far more than punching and kicking; it extends from the physical exercise, which is both disciplined and fun, to embrace almost every aspect of a child’s world. We do not engage in sparring, which we believe only serves to encourage aggression and induce stress. Sparring is usually conducted under a set of rules and probably under the control of a Judge or referee. Neither of which would occur in an assault in the street, etc. We do not promise to turn your child into the next Olympic Martial Arts medal winner. There are no competitions as such. We believe that for every student that feels success in their victory over another, the other inevitably feels a loser. Our aim is to ensure each and every child leaves the Dojang with positive feelings toward themselves and others – feelings that can be carried forward into their daily lives. You train with partners not opponents, and partners are there to help you become the best that you can be. What we do – the changes we have seen in children…….. Enhanced confidence: we have seen children grow hugely in confidence, using this to confront new and different challenges – in school, at home, in sports, in relationships – with an increased sense of purpose and belief. Mental, emotional and physical strength: we know that, after just a few weeks, our children are far better able to defend themselves physically, but perhaps more importantly that they will be able to deflect or confront the mental onslaught of a bully, of peer pressure, or of an unkind friend. Increased self-esteem: an enhanced sense of self is extremely important to a child who is going through so many stages in life so quickly. The children in our classes develop the ability to recognise the aspects they need to improve (homework, relationships, effort) with determination rather than dread. An appreciation of their physical selves: children will only stick at exercise they enjoy – so we make sure they do! Our classes are so much fun, your child will beg you to let them come. They do actually enjoy doing squats, burpees and jumping jacks. They take pride in their enhanced fitness. Choi Kwang Do is best enjoyed as a family………. We encourage all parents to share in the benefits of Choi Kwang Do and enjoy the activities with their loved ones. Why not try it out? We cannot do the benefits of Choi Kwang Do justice in words, so why not book your child on a free introductory class and let them see for themselves. Please call us free on 0800 990 3071 where we guarantee to greet you with a friendly welcome. I originally signed my children up for Choi Kwang-Do to give them a grounding in self defence and to encourage their fitness. I thought the class would help them with focusing skills as well as giving them another social outlet. I have found the classes offer all of this and also help to raise self-esteem, due the frequency of upgrade in belt with certificates and constant challenges to motivate them. The reason for my writing however, is to express my delight and satisfaction as to how ‘child friendly’ yourselves and all of your staff have been. My children were received with a very warm welcome and all of the staff have been gentle, polite and courteous, giving both of my children a secure and positive feeling towards the classes. 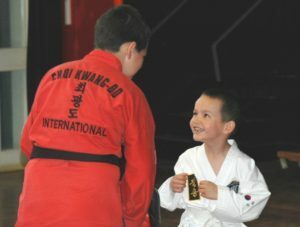 The fact that Robert has done so well is in no small part due to the helpful, friendly and fun instructors as well as the general 'respect your help and fellow students' ethos, that is so successfully promoted within Choi Kwang-Do. We'd like to thank you once again. Enrolling Robert has been a great success, hugely rewarding on every level & on a practical level incredibly good value for money.